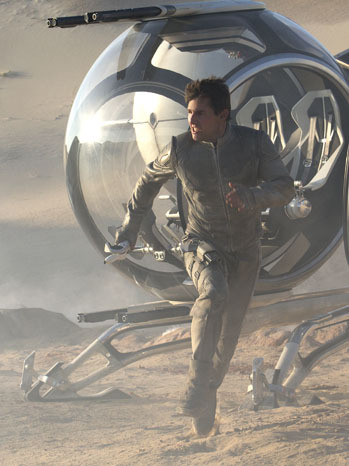 Foreign Box Office: Tom Cruise's 'Oblivion' Opens No. 1 With $61.1 Million Overseas | Radical Studios, Inc.Radical Studios, Inc.
UPDATE: The sci-fi tale claimed the top spot in 48 of the 52 territories in which it bowed, while the animated “The Croods” took in an additional $25.5 million. Tom Cruise‘s Oblivion claimed the top spot at the foreign box office this weekend, amassing $61.1 million at 7,444 dates in 52 territories. The Universal Pictures release, which opens this coming Friday in North America, is running 75 percent above Cruise’s last international opening in Jack Reacher. The weekend also saw Fox’s release of DreamWorks Animation’s The Croods take in an additional $25.5 million, while Paramount’s GI Joe: Retaliation grabbed $15.6 million, Disney’s Oz The Great and Powerful took in $5.2 million, and Sony’sEvil Dead picked up $2.9 million. Directed by Joseph Kosinski and produced by Kosinksi,Peter Chernin and Dylan Clark on a budget of $120 million, ranked number one in 48 of those 52 territories. The movie took in $3.5 million of its total from 140 Imax theaters abroad, registering a per-screen average of $25,070 in the large-screen theaters that it played. The movie saw its highest returns in Russia, where it collected an estimated $8.6 million at 670 dates, marking the biggest opening of a 2D film this year and Cruise’s biggest opening of all time, the distributor reported. In the U.K. and Ireland, it was number one with $7.9 million; in France, it was number one with $3.9 million; and, in Spain, it also held the top spot with $3.1 million. Across South East Asia, it achieved a 50 percent market share, doing best in Korea where it grossed $4.1 million. It also ranked first in Australia ($3.6 million) and Mexico ($2.8 million). Oblivion opens in the U.S. and Canada and seven more international territories this coming weekend. Meanwhile, The Croods ranked second in such key territories as France, the U.K., Australia, Brazil and Mexico. Its $25.5 million take represented a drop of just 26 percent from the previous weekend. Its international tally has grown to $244.8 million, putting its worldwide number at an estimated $387.3 million. Collecting an additional $15.6 million in 62 territories, Paramount’s GI Joe sequel saw its international cume climb to $168.3 million and its worldwide total hit $270.7 miillion. Disney’s Oz bolstered its bankroll with another $5.2 million from 57 territories. Its international total is now $251.6 million and its wordlwide total $471 million. Playing in 24 markets overseas, Sony Pictures Releasing International’s Evil Dead ranked second in Russia and Spain — it was in its second weekend in both territories — as it took in $2.9 million to bring its foreign cume to $10 million. It opens in Brazil and the U.K. this week. While Scary Movie 5 ranked second domestically, it also took in $3.5 million from for territories, contributing to a worldwide total of $18.7 million. The Place Beyond the Pines matched its domestic weekend of $4.1 million with foreign returns of $2.2 million from six territories. Its worldwide total is $13 million. Fox International’s Dragonball Z also held onto the top slot in Japan for the third week in a row, grossing $2.8 million to bring its international cume to $23.8 million.